Isn't it strange that the things I most enjoy making are the teeny tiny projects? Well, not that strange, I suppose, considering small projects are fast, and generally easy, and they provide that instant gratification that larger projects, like sweaters and scarves, just can't. Even so, the best-used and loved of my creations are the little ones. 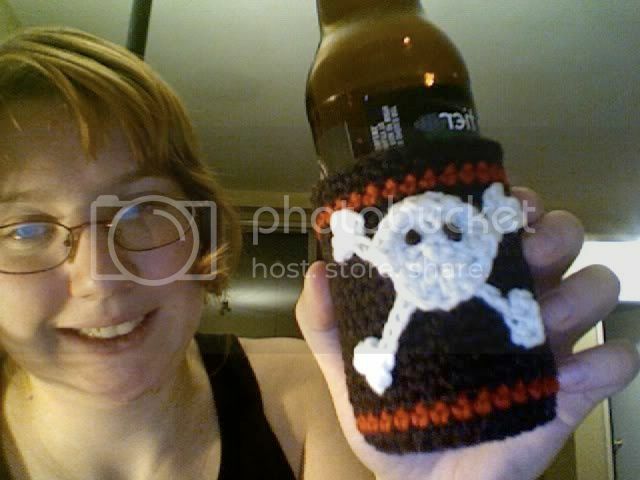 For example, I created this pirate beer cozy from a Lion brand pattern for my boyfriend and I think it's the thing he's used the most of all the stuff I've made him, including his hat and scarf. I have great plans to make more of these, in different colours and with different appliques. I want to make an astronomy-themed one for myself, and my boyfriend has been bugging me to make a fleur-de-lys one. 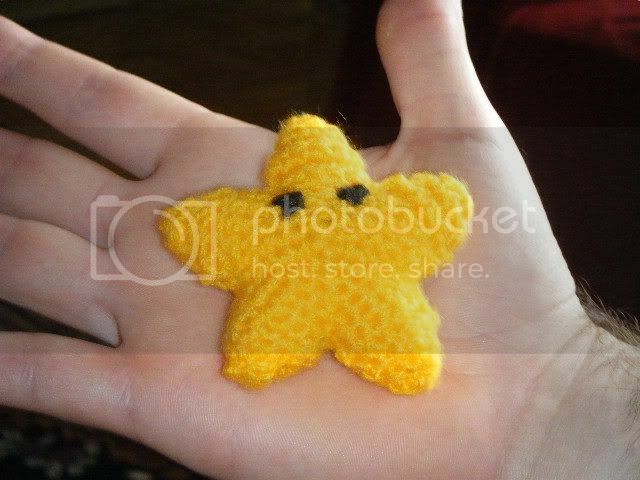 I've also made this Super Mario Invincibility Star at least half a dozen times to give to friends. Two have gone to babies. There's nothing like the squeal of delight when I give one to a geeky friend, and it seriously takes under an hour to make one. 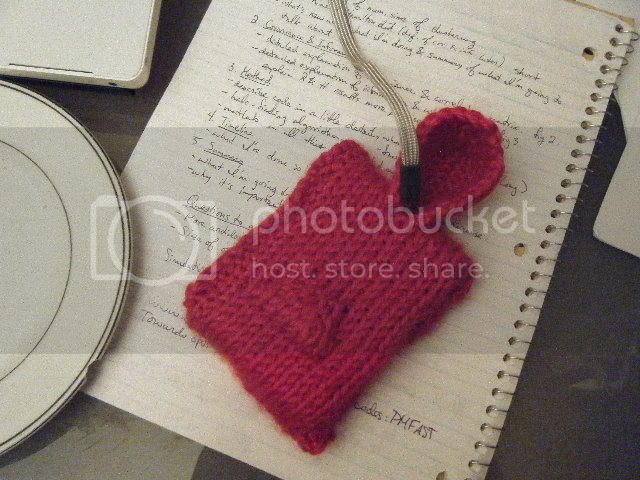 Another one of my favourites is the case for my camera... instead of buying some sort of fancy case, I crocheted my camera a sweater! Based on the iPod hoodie, this was my first foray into Tunisian crochet. It was really fun and easy, and produced a fabric that looks knit, but is a lot thicker, thus providing more protection for my camera. The only thing I modified was to add built-up sides (to make it more like a box than an envelope) so that it would better fit the shape of my camera. Finally, I made a little rose hair pin which I wear all the time. I really love it, and it was really easy to make! 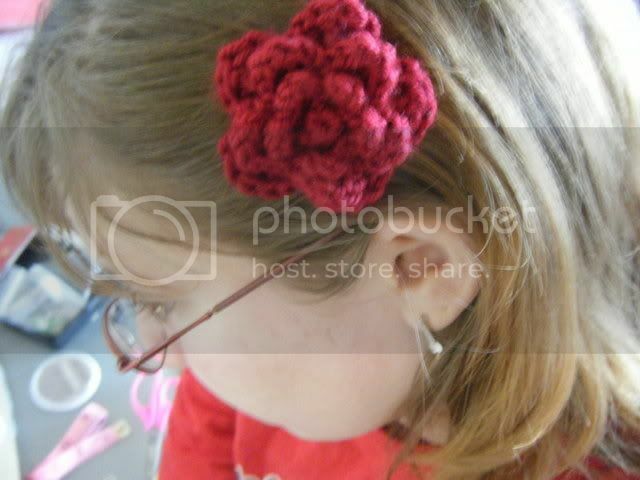 The rose pattern is from The Anticraft book as part of the "Briar Rose" pattern. P.S. It's really hard to take good pictures of the side of one's head.